A back brace is simply a device that immobilizes, restricts or influences the movement of the spine. Back braces may be worn for a variety of reasons, but they’re commonly used to treat spinal injuries, muscular injuries or degenerative conditions like scoliosis. There are two primary types of back braces used to treat conditions like those previously mentioned. The first type of back brace is the rigid/hard brace. A rigid back brace is typically constructed from a plastic mold and is form fitted to the contours of the spine. These back braces are designed to greatly restrict spine movement especially in the lumbar (lower) region, if not restrict the movement of the spine entirely. Limiting the motion of the lower spine not only helps in the healing process, but also aids in the reduction of lower back pain and discomfort. Unfortunately, rigid braces also tend to be heavy and cumbersome leading to a general feeling of discomfort for the wearer. 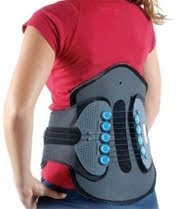 The second and most common type of back brace is the soft back brace which is also commonly referred to as a corset brace. The soft/corset brace typically features a flexible elastic band that limits forward movement of the spine. These types of braces are frequently worn by individuals who are required to lift heavy loads such as construction workers or movers. These braces not only limit the motion of the spine, but they also encourage proper lifting techniques utilizing the muscles of the legs rather than the back. You may now be asking yourself, which back brace is best for me. This question is best answered by a physician or back specialist, because they will know the details of your specific condition and how to best alleviate the problem. Although rigid and soft back braces are fairly common, many health care providers are likely to recommend back strengthening exercises and stretching as alternatives to a back brace. According to numerous physicians, back bracing can potentially lead to significant muscle loss which is another reason why it’s vital to speak to a health care professional when deciding if a lower back brace is the best option for you. About the Author: MMAR Medical Group Inc. is a premier supplier of high quality medical products including a wide selection of orthopedic braces and supports, as well as diabetic and comfort shoes. To find a quality specialty orthopedic braces, such as a hinged knee brace or lumbar brace, please visit MMAR Medical online.